Knibb's Battery is a family-oriented living history unit based in Richmond, Virginia. We strive to honor our heritage through accurate depiction of a working Confederate artillery battery. 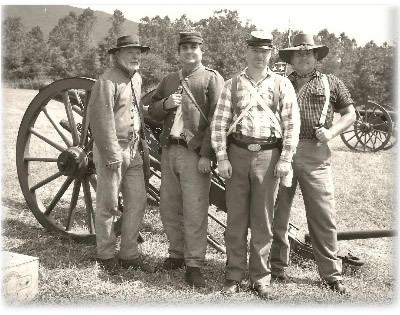 Units we portray include the Goochland-Turner Light Artillery (1861-1862), the King William Artillery (1862-1864), and the Tredegar Artillery (1864-1865), the Southern Scotts Light Artillery, the 3rd Maryland Artillery, the Georgia Light Artillery, the South Carolina Light Artillery, the Louisa Artillery, Giles Light Artillery, First Company, Richmond Howitzer. We welcome all recruits regardless of experience. We are an active unit participating in reenactments, memorial and graveside services, living history, and other special events. Our members hail from all walks of life and a variety of backgrounds. We put safety first, but strive to have fun, too.